First, check the radio button New user. Then fill in the details for a New user. The fields Display Name, E-mail address, and Alternate E-mail Address are mandatory. Next you have to set a password for a Mailbox, and re-type it to confirm. Make sure the password you set meets the security criteria. If it does not, you will see a pop-up notification explaining current requirements. Checking Password Never Expires checkbox will make a password valid forever. If you check Send Password Request checkbox, instead of typing in the password you will be asked to enter Email address where the request will be sent. Then choose the mailbox type. Four options are available: User Mailbox, Room Mailbox, Equipment Mailbox, and Shared Mailbox. Next step is to fill in the details such as a physical address, a phone number and a fax, along with company detail information. You can fill these details right away or later. 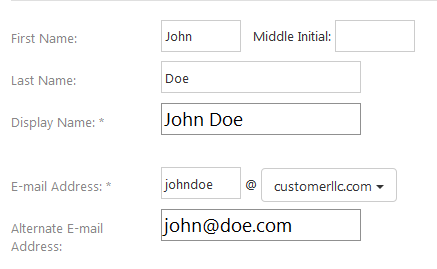 The only required field left to deal with is Mailboxplan Name, which you have to select from a drop-down menu. Finally, you can apply a Retention Policy, if any, and decide, if you want to Send Setup Instructions to a certain E-mail address. The last step is to click on Create Mailbox button in the bottom of your screen. Hooray! 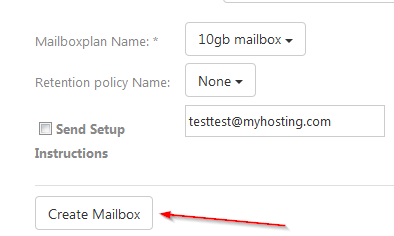 The new Mailbox has been created, and you have been redirected to a Settings page for this Mailbox.